Well it has gone and gotten cold and I enjoyed the crisp air in Mountain View, Arkansas this past weekend, January 25 & 26, 2019 teaching watercolor techniques. What a pleasant group of women anxious to learn to create their own small abstracts. They worked and studied hard. There were a couple who were totally new at watercolor. I always love beginners because they come in so nervous and leave the workshop excited to have learned this amazing medium. As usual I took quite a few pictures. Take a look and see if you recognize anyone and look at some of their works. Thanks Arkansas Craft School for sponsoring this workshop. It is truly amazing how fast 5 weeks can fly by.....that is what happened with the colored pencil class I just finished teaching yesterday at Ouachita Artists Gallery and Studio in Mount Ida, Arkansas. 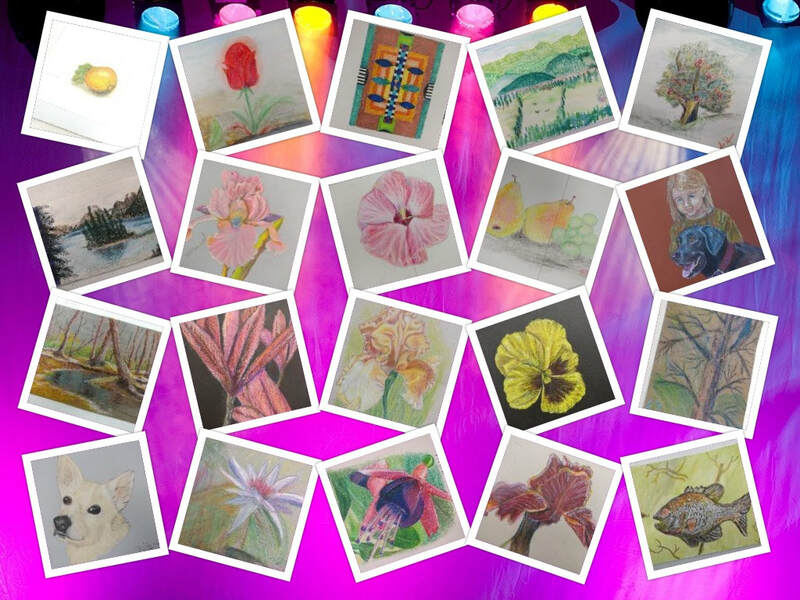 Nine lovely women created some really FINE pieces and here is a collage of just some of their works. Good job girls and what fun we had just working together and sharing good times, stories and laughter. A lovely warm Saturday in May I traveled to Pine Bluff, Arkansas with my wax in hand and photos of flowers and introduced to the group (Pine Bluff League of Artists) taking the workshop how to paint flowers in a different way. I also managed to introduce a few other mediums like colored pencil and oil pastel. ​Take a look at the group experimenting on May 5, 2018. Thanks for having me come. I enjoyed you all.